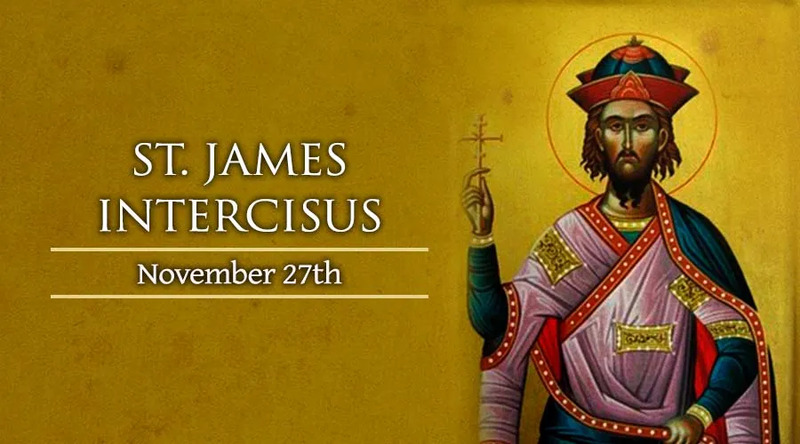 A soldier and courtier to King Yezdigerd I of Persia in the early fifth century, James was a Christian who, during Yezdigerd’s persecution of Christians, renounced his faith for fear of death. His family, who had not apostacized, contacted James upon the death of the king, and thus the end of the persecution, and chastised him for having renounced his Heavenly King before the worldy king of Persia. Upon hearing the rebukes of his family for the denial of his faith, James was thrown into a deep crisis of conscience, and he went through a true, deep conversion, uniting and conforming himself to the living God. Wanting to make amends, he professed his faith before the new king, Bahram and was condemned to death. He is referred to as ‘Intercisus’ because the name literally means ‘hacked to pieces,’ and this name was given to him documenting the manner of his death. He was hung from a beam and slowly cut into 28 pieces, beginning with his fingers and then his toes, hands, and so forth until his beheading, the final cut. Even though the crowd, made up of many Christians, urged him to renounce his faith and worship the sun because they could not bear to see him suffer such excruciating torture, he never renounced his faith. Instead, he made every piece cut from his body an offering to the Living God, and won the crown of martyrdom. James Intercisus is the patron saint of lost vocations and torture victims.